Tour Bus Accidents | Nashville Injury Lawyers The Law Offices of John Day, P.C. A tour bus is a bus service that offers sight-seeing services to tourist attractions or pre-determined destinations like casinos, wine-country, national parks, etc. Tour bus trips can be a fun, inexpensive way to travel, but they can also be dangerous if they are operated with poorly maintained equipment or unsafe drivers. 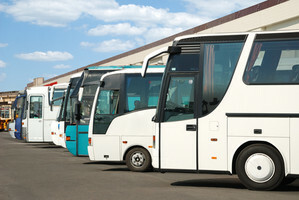 Because tour bus companies advertise and accept payment for their services, under Tennessee law, most courts will consider them a "common carrier". Common carriers owe their passengers the highest degree of care as opposed to ordinary care. In addition, most tour buses will be subject to the requirements of the Federal Motor Carriers Safety Regulations, which dictate such things as licenses, equipment maintenance, hours of service, etc. In 2008, according to the Federal Motor Carrier Safety Administration, there were 843,308 registered buses in this country. And, roughly 24,000 people were injured or killed in bus accidents in 2008 alone. Tour bus accidents can be caused by many factors: driver fatigue, faulty equipment, inadequate training or supervision, distracted driving such as cell phone use, unsafe driving maneuvers, drugs and alcohol and many others. And because so many buses are not equipped with seat belts, the injuries can be devastating including spinal cord injuries, crush injuries, burn injuries, broken bones, brain injuries, etc. At the Law Offices of John Day, our bus accident attorneys have more than 80 years of experience in helping injury victims. We have recovered more than $100 million dollars for our injured clients and we can help you too. We offer a free, no-obligation consultation in which one of our knowledgeable bus accident attorneys will thoroughly discuss your bus accident with you. And, we only get paid if we recover money for you. Contact our team of bus accident attorneys today at 615-742-4880 or toll-free at 866.812.8787 or contact us online. If your injuries prevent you from coming to our office, we will gladly come to you at your home or the hospital.